The creepiest, most phantasmagorical movie I’ve seen this summer has no zombies, vampires, aliens or mutants. Unless, that is, you wished to apply any or all of the above to characterize Anwar Congo, the Indonesian gangster and wannabe moviemaker profiled in The Act of Killing, Joshua Oppenheimer’s true-life chronicle of how Congo tried to make a glorified cinematic re-enactment of his country’s mid-1960s massacre of thousands of men, women and children suspected of communism. This enterprisingly deadpan inquiry into the banality of evil has slithered its way into our season of sun-and-fun to announce that not only is fiction dead, but so is black (as in absurdist) comedy. Why even bother trying to outgun Nathaniel West when Real Life can hand off an acrid fungus of a storyline such as this? It helps not only to have reality be so obliging, but to have the collective vanity of killers comply with Oppenheimer’s audacious request. Then again, what is viewed as atrocity almost everywhere else in the civilized world is still embraced as glory by many Indonesians, especially the far-right paramilitary group Permuda Panacasila whose members swarm around the edges of this saga like mean orange hornets. This cluster of baby martinets owes its existence, apparently, to Anwar Congo, who before the failed 1965 coup that led to the Suharto regime, dealt in black market movie tickets and other relatively petty thuggery. For two years, Congo led death squads throughout North Sumatra in a bloody purge of those suspected of being communists, including several hundred ethnic Chinese from whom he and his goons extorted money in lieu of death. Of the estimated half-million-to-a-million murdered throughout the country in 1965-66, Congo figures he personally killed roughly a thousand, mostly by garroting. But a pall seeps into the process as one actor, who boasts about turning in his girlfriend’s Chinese father to the death squads back in the day, is helping re-enact a brutal interrogation. At first, he can’t quite get into character as a trussed-up victim who knows he’s going to die no matter what he tells his inquisitors. After a few takes, he starts weeping and sobbing as convincingly as the child performers who were earlier directed to wail over the brutal capture of their grandfather in their living room. It isn’t long before Congo, who casts himself as a movie exhibitor beaten by gangsters for refusing to yield to the autocracy, starts to feel a little queasy himself. By the end of this movie (not the one Congo’s making, but the one he’s abetting), this nausea literally erupts into an ugly, savage retching that, oddly (and perhaps appropriately), leaves no visible residue. It’s possible that viewers will demand from The Act of Killing more emotional residue; or at least a less abstract approach to such wanton and still-unpunished mass murders. And yet, in being forced to take a more indirect approach to an historic atrocity, Oppenheimer’s film somehow manages to slice your nerves as deeply as any series of gruesome testimonies from survivors. Watching deformed memories deform society is infuriating. Yet this movie’s outcome represents one of the most perversely satisfying of any muckraking documentary of its kind. 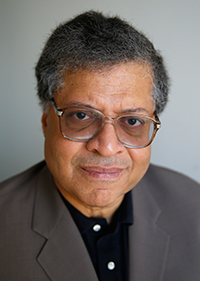 The Act of Killing reminds you that no matter how much denial is embedded in a nation’s collective culture, imagination somehow manages to step in as the mind’s own truth squad, the crafty, elusive enemy of anybody’s Thought Police – even our own. IMMEDIATE REACTION: What does it mean that while only 26 percent of critics on Rotten Tomatoes’ scale approved of this movie, 68 percent of audiences have so far liked what they saw? Probably nothing. Maybe everything. It’s way too long – as are so many big-studio blockbusters intent on showing every single dollar spent on screen. It’s at times a tad too pleased with itself, especially in the way it blatantly samples from so many other (better) movies from Little Big Man to The General (lots and lots from The General, in fact, given all those intersecting locomotives) to the collected works of Sergio Leone, Steven Spielberg and even its own director Gore Verbinski. And while it’s far more respectful towards indigenous Americans than you might believe, you still wonder why they all…well, I wouldn’t want to give too much away even if you have no intention whatsoever of seeing The Lone Ranger. And a lot of you don’t, I’m sure, based on its overwhelmingly negative reviews and its underwhelming box-office results thus far. That bad odor followed me into a bargain matinee of Lone Ranger this week. I couldn’t help it, being of a certain age wherein I cut my teeth on the 1950s Clayton Moore-Jay Silverheels TV series, devoured the legend’s crudely captivating mid-1960s animated TV version and was as recently as a year ago pulling people’s coats about Brett Matthews and Sergio Cariello’s controversial graphic (in every sense of the word) novel which steeped the creaky old mythos in oily western noir. I had to see for myself how bad the movie was and as I watched, I kept waiting for it to start getting as irredeemably awful as everybody warned me it would. It never happened. 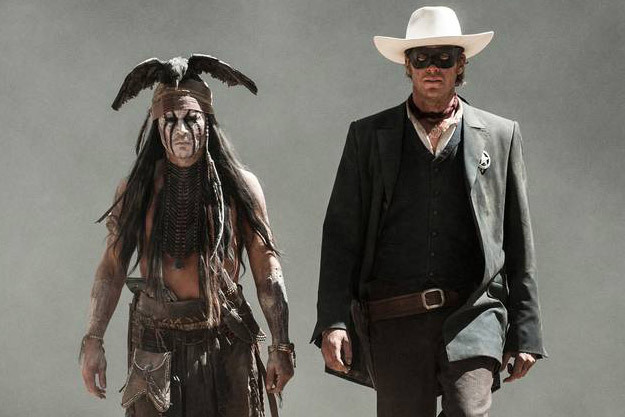 In fact, for all of its problems, The Lone Ranger turns out to be a buoyant, insouciantly subversive ragbag epic. As only a few others besides me have noted, even the aforementioned samples from other movies contribute to Lone Ranger’s fun-house distortions of both frontier mythology and popular culture. Yes, it conspicuously takes on the trappings of a gimmicky action blockbuster with a campy Johnny Deep star turn jury-rigged to draw in those who unconditionally loved the last couple of gimmicky action blockbusters with a campy Johnny Deep star turn. But the movie subjects its own motives and methods to constant scrutiny and, in hit-and-miss fashion, weaves this self-awareness into the narrative with goofball nonchalance. It’s every bit the arch, intricately designed feature-length cartoon that the Verbinski-Depp collaboration, Ringo (2011) was, only with more flesh, blood and gore, so to speak. If this version had come out back in 1981, instead of that misbegotten, deservedly forgotten The Legend of the Lone Ranger, it might have been seen as a genre-transforming breakthrough. Now, it’s just a big fat Hollywood summer movie that seemed destined for cautionary-tale status even before it opened. There was also an undercurrent of Depp Fatigue in these advance warnings. In this age of gnat-wing attention spans, the air was buzzing with whispers that Johnny Depp’s high-concept dress-ups were getting thin and (more to the point) less lucrative. Last year’s Dark Shadows applied a coup de grace to the idea of Depp’s outrageousness carrying a movie along. His Barnaby Collins was a blissfully, sometimes poignantly realized reboot. But you kept waiting in vain for the rest of the movie to get better – or get moving. So one imagines the long knives were unsheathed for this Depp turn, especially since he had the cheek to assume the role of Tonto, the title character’s Native American companion. Geez, why not the Lone Ranger? After all, he’s…you know…and you’re…like…and Tonto…He’s…Oh jeez, this is SO awkward…. And sure, it would have been wonderful for Disney and company to seek out a Native American actor who could bring to this Tonto the kind of comedic timing, deadpan agility and glam-rock swagger that made Depp a star. But we don’t live in that world now. (We should, but we never did and likely won’t in the foreseeable future because trees are smarter, braver and more imaginative than most of the bean counters running the movie industry these days.) As he did with Barnaby Collins and, to a lesser extent, with Willy Wonka, Depp inhabits not just a pop-culture figment of somebody else’s imagination, but our own tangled presumptions about that character to the point where he can upend, shatter and remake those presumptions to his own eccentric specifications. Put another way, it’s hard to think of Depp’s Tonto as red or white (not even with that threadbare makeup cracking and peeling before our eyes.) He’s the stone-faced imp in our collective memory bank, rewiring a hallowed, if anachronistic pop myth so emphatically that even that Kemosabe cube has to rethink his heretofore tidy value system. Also, how can anyone say this Lone Ranger maintains the hierarchical status quo when just about every one of its pale male characters, especially its eponymous hero-savant, comes across as some variant of a “stupid white man”? This won’t mitigate the carping and it shouldn’t. Just like it shouldn’t have taken 145 minutes to make an entertaining western adventure-spoof. (Blazing Saddles clocks in at 93 minutes; even The Mask of Zorro managed to maintain a brisk, eye-filling pace at 136 minutes, complete with set pieces.) Half the plot strands, even the slingshot-wielding kid who is maybe the Green Hornet’s grandfather, could have been dispensed with. But more not less is, as noted, the profile Hollywood insists upon for action movies. Verbinski’s movie can’t help but resemble a mammoth popcorn spectacle given the global market demands. The real fatigue Lone Ranger represents isn’t with Johnny Depp or even with westerns, though this movie’s perceived failure may have further pushed back the genre’s dim prospects for resuscitation. It’s with the hidebound hot-air chatter over summer tent-poles and trillion-dollar spectacles. If the two guys most responsible for initiating this era of movies now foresee its demise, then the timing for Lone Ranger Redux is even worse. This version should have been made at least thirty years sooner. It could be another twenty years before we can say for sure whether it’s bad or good.